In addition to having lunch, golf for a foursome, snacks and beverages (alcoholic and non-alcoholic) on course and dinner, a Premium Foursome includes a golf cart windshield banner with your team name. Please include your team name and preferred colors for your banner. This is a great opportunity to spend the day with a client, treat employees on network with industry colleagues while supporting a noble cause. Golfers compete for winning team trophies, individual skill prizes and hole-in-one prizes. Highlights of the event include the Grand Prize Raffle Delta Tickets, exciting opportunities for gift certificates, dinners, golf items and more. The golf outing offers many opportunities to support the JASP from $150 - $3,000. Options for sponsorship are listed after choosing your type of registration. If you just want to be a sponsor, click on "I just want to be a sponsor" as you registration type and all of your options for sponsorship will be listed with their donation value. All supporters are publicly acknowledged. Registration deadline is Monday, April 30, 2012. Contact Kelly Chaney at kchaney@us-japan.org or (412) 433-5021 with questions. 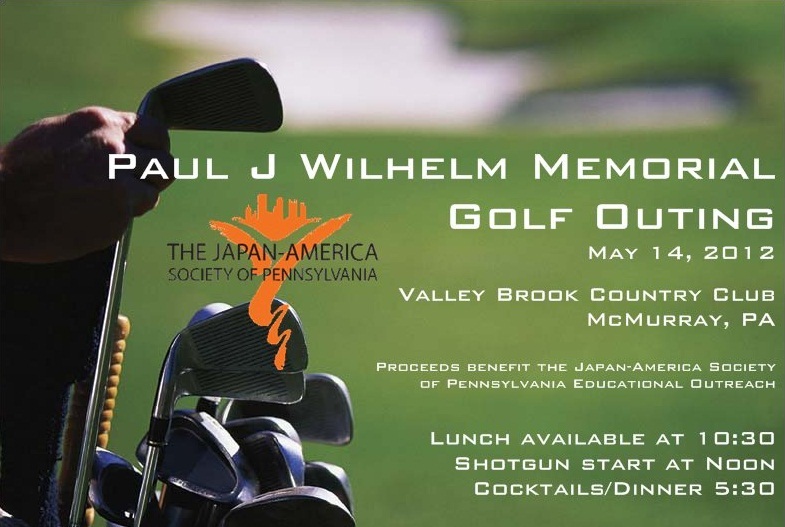 Proceeds benefit JASP educational programs for students, training for teachers and an annual speech contest held in conjunction with the University of Pittsburgh.